The following article contains some spoilers for Guardians of the Galaxy Vol. 2. Marvel’s latest superhero epic Guardians of the Galaxy Vol. 2, which was released in Hong Kong on April 27, dropped a fantastic surprise in one of their post-credit scenes. The superhero film is the sequel to the 2014 film of the same name, and sees Chris Pratt reprising his role as the human Peter Quill (aka Star-Lord), who along with his band of extraterrestrial misfits go on an galactic adventure to learn more about his own parentage. In a post-credits scene, Chinese Malaysian actress Michelle Yeoh (楊紫瓊) made a cameo appearance as Aleta Ogord, the female counterpart of Stakar Ogord, portrayed by Sylvester Stallone. According to the comics, both Stakar and Aleta were a part of the original Guardians of the Galaxy. After triggering a mechanism in a statue of the Hawk God, Aleta’s body got dematerialized and turned into energy, merging into Stakar. He became much more powerful as a result, becoming the Starhawk. 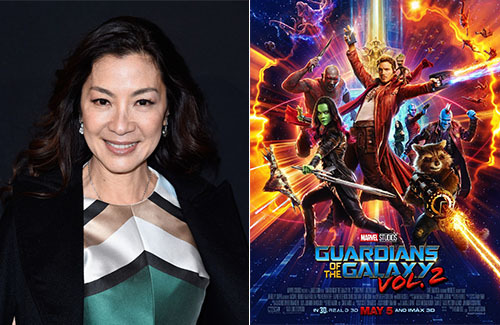 Michelle’s appearance in the post-credits scene of Guardians may be an introduction to her recurring appearances in future Marvel films. Michelle is the second Chinese actress to appear in a Marvel superhero film, after Fan Bingbing (范冰冰), who starred as Blink in 2014’s X-Men: Days of Future Past. Guardians of the Galaxy Vol. 2 opens in the United States and China on May 5, 2017. She looked great, kinda like Cate Blanchett in the Thor Ragnarok trailer. I thought she was planning on starring in a new star trek series too? I think she could be great, judging from her brief appearance in Guardians.